Dubai: A family believes their infant son who was declared dead 30 years ago is still alive. 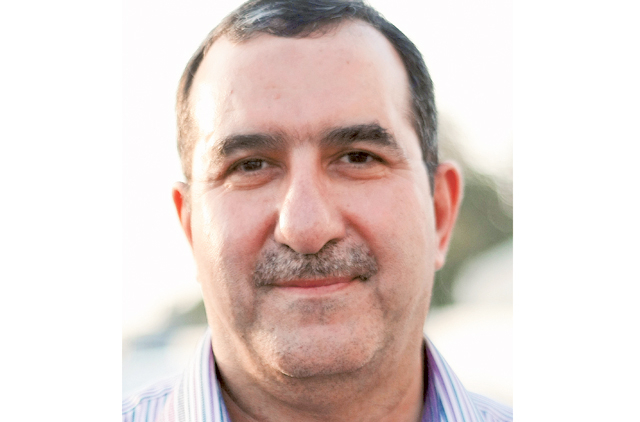 Iraqi Fadil Hashmi, who works as an engineer in Abu Dhabi, recounts the hunt for his son who he thinks was kidnapped. Hashmi has been trying to uncover the truth for some 20 years. Hashmi has left his family of three — his wife Suroor as well his son and daughter — in Canada and has been living in the UAE for almost nine years just to be near Iran, so that he can find his son. Their son was born in an Iranian Hospital in 1984. Three days later the father was told his son was dead. Six years ago he opened his grave, but did not find his son’s body. Hashmi and his wife were living in Iran — his wife’s home country. When she went into labour and he took her to Sajjad Hospital in Tehran, where she delivered a healthy baby, according to medical reports seen by Gulf News. He said they choose the name Mohammad for his son, but it was not made official on any documents. Hashmi told Gulf News that after the delivery the baby was taken away and kept on a different floor at the hospital. His son was not given to his mother for feeding. His wife was discharged the same day and they were advised to keep the baby in the hospital for a few days. He used to visit the baby daily and nobody told him his son was ill. On the third day Hashmi went to the hospital and was told to wait for a doctor, who told him his son had heart and brain problems. Hashmi was then given the dreaded news: his son had died. Hashmi said he took the doctor’s word for it and did not question the claim that his son was dead. He did not ask to see his son’s body because he said it was traumatic. And that was the first step in his 20 years’ struggle to find out if his son is alive somewhere. Hashmi filed a court case against the hospital, claiming that he had not been given evidence of his son’s death. The court ordered police to investigate. “When we went to the hospital, there was no death certificate nor was there anything to prove he was dead, except a notice of death that was not fully filled out. The notice was issued eight days after the day I was informed my son died.” Hashmi said. The death notice did not have the baby’s date of death, gender, parents’ names or the name and signature of the person who handled the body. The document also showed that the cause of death was that he was a “premature baby”. The father said this is untrue and contradicts the initial report that the baby was a “normal newborn”. Their next stop was the cemetery where the baby was supposedly buried. When they checked the records, Hashmi found out that another baby was buried in the same grave as his son’s. But his son’s surname “Hashmi” was written on the grave. The court found the hospital not guilty of issuing an untrue death certificate due to lack of evidence. 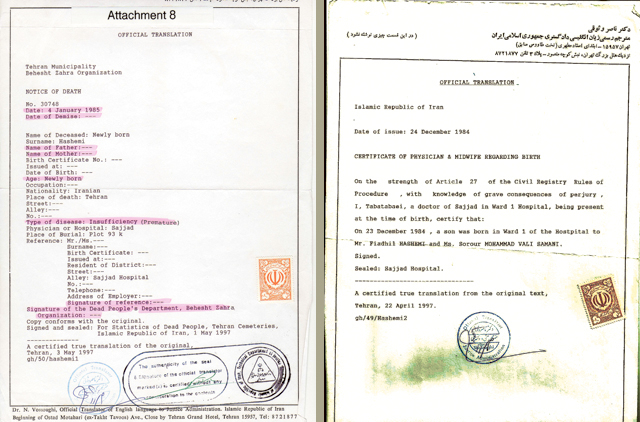 Hashmi showed Gulf News documents issued by Iranian Ministry of Health a report that highlighted the discrepancies in the hospital’s paperwork. The ministry recommended there be further investigations. It said he should pursue the case with judicial and police authorities. Hashmi claims that once the case was closed the doctor who was implicated, told him a number of times that his son had not died. Hashmi said the doctor told him this because he thought the case was closed and would never be reopened. 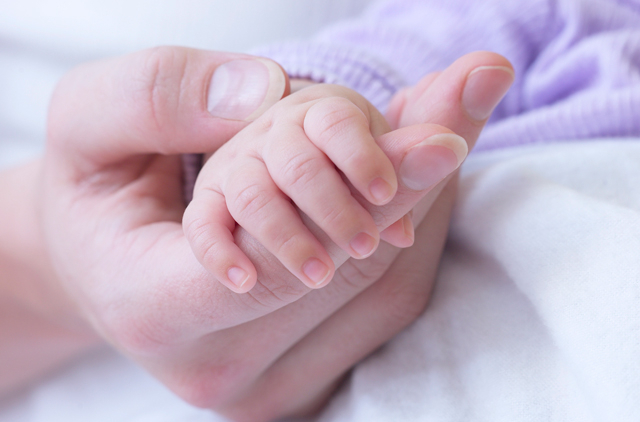 An Iranian newspaper Etemaad reported that a woman was arrested following multiple complaints to police from mothers whose newborns were stolen. A 30-year-old-widow was arrested. She confessed to stealing more than 70 babies and selling them to rich families after faking their documents with the help of employees at the Iranian Department of Civil Status. This report among others, Hashmi said, confirmed his doubts that his son is not dead. Hashmi attempted to reopen the case and requested exhumation. He received approval and when they opened the grave, they found only one skeleton. “Representatives from a genetics lab took samples from the skeleton, but due to poor technology, they could not get any results. However, when they compared size of the bones with my son’s birth record, they found that the skeleton in the grave was bigger than my son’s so it could not have been his. Forensics also confirmed the results.” Hashmi said. Documents showed that Hashmi’s son was 44-centimetre long and the circumference of his head was 34cm. On the other hand, the skeleton that was found in the grave was 50cm long. The circumference of the head was 37cm. Investigators had also opened an adjacent grave by mistake and found it empty. Papers showed that there was a body buried there. Hashmi said this brings the cemetery’s records into question. The genetics centre in Iran re-evaluated the DNA sample from the grave following a letter from court. The research centre now had advanced technology, which tested the DNA samples. Tests proved that the DNA of the skeleton found in the grave did not match Hashmi’s wife. But even these findings were not taken seriously and the case was frozen. Hashmi hopes his son will read news reports and realise that may be he was this missing baby and try to contact him. Suroor, Hashmi’s wife, told Gulf News in a phone interview that her health has suffered greatly because of this incident. She said when she was told her son died, she became depressed and had to go on medication. “It got worse when we realised that he can be alive, I have been on strong medication ever since and I have not been able to have a good night’s sleep.” She said she takes sleeping aids to help her sleep. Like her husband, she said she hopes their son will read news reports and contact them.